Every so often, we like to take a look to see what Tallahassee Realtors have been doing. Obviously, the Tallahassee real estate blog focuses on home sales in and around Tallahassee, but we rarely break it down to a level that lets our reader see what the average Realtor in Tallahassee is selling. This information is important for several reasons. If you are buying a home, don't you want to work with somebody who has honed their craft through numerous other transactions (meaning they won't be making their learning mistakes when negotiating on your behalf)? And if you are selling a home, don't you want somebody who negotiates on a daily basis so they can provide you with the absolute best guidance about the Tallahassee real estate market? Finally, if you are thinking about a career in real estate, don't you want to know the state of the industry and the likelihood of earning a great living? 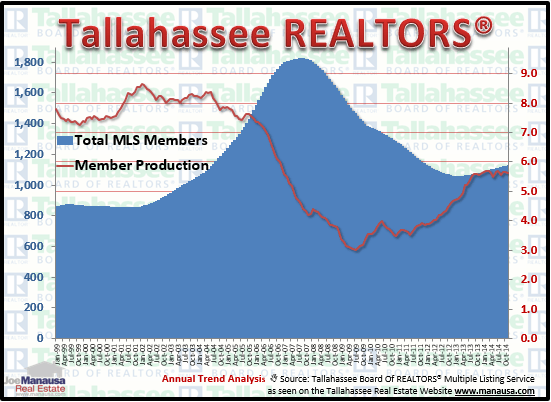 The following graph shows the changes in the number of Realtors in Tallahassee and plots it against the number of homes sold per Realtor over time. The blue area measures average monthly MLS membership (recorded on the left vertical axis) while the red line measures the average number of homes sold per year in Leon County by the members (recorded on the right vertical axis). Currently, membership is on the rise and individual production is holding fairly steady at 5.6 homes sold per year. So what does this mean for the coming year(s). I believe that membership will rise as more and more people renew their selling and buying habits. As unit sales rise, more people will be tempted to "get their license" so they can make some extra money. So consider this a fair warning. The majority of real estate agents in Tallahassee are part time, but the majority of real estate consumers need full time advice and counsel. If you would like to see what a full time Tallahassee Realtor can do for you when selling or buying a home in Tallahassee, just drop me a note and we'll be in touch right away.